E.M.M.A. - Mindmaze / Pumpkin Emoji. Vinyl 12. Bleep. E.M.M.A. 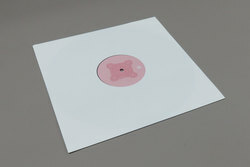 follows up some recent drops on Astral Plane with her first solo release on Coyote Records (Chemist, AJ Tracey). Never afraid of incorporating some humour into her output, the two tracks here see the Angel Food/Producer Girls mastermind indulging in something she has termed ‘medieval funky’. The description certainly rings true on the A-side. ‘Mindmaze’, a track originally cut for Mumdance and one E.M.M.A. says is ‘a homage to the Encarta 95 CD-rom’, is a stately procession of Zelda flutes and chiptune harpsichords over grimey 808s. It’s an unexpected treat, joining more dots between grime and 90’s video game music. For the flip, ‘Pumpkin Emoji’ is equally regal-sounding while incorporating some sombre Kraftwerk-esque synth chords.